much has been made of cyclists riding in poor weather or after dark in trendy black clothing, hiding themselves from the searching eyes of the ever-vigilant motorist. to a greater or lesser degree, it's a stance that is hard to argue with, though probably considerably less of a problem at this time of year, with its longer days and lighter nights. but some of the younger folks tend to stay out later than retiring hebrideans. i am assuming, for the purposes of clarity, that all those riding after dark, no matter the clobber, have appropriate front and rear lights attached to the bicycle. if not, you're on your own and i have little sympathy. thankfully, more recent releases from the world of cycling apparel have adopted brighter hues, though in mitigation, most of the blackout gear is peppered with reflective strips to prevent total anonymity in the deep of night. when it comes to such discussions, and i know this from personal experience, the average motorist adopts the higher moral stance, though less on behalf of cyclist safety, more on their own self-righteousness. when the tables are turned, even if surreptitiously, that moral stance receives an unhealthy boost of testosterone. though it would be naive to point an accusatory finger at drivers of black cars, (the advent of the light emitting diode has lit most of them up like mobile christmas trees), there are other shades and hues that might conceivably raise the ire of the pelotonese. this partially relates to yesterday's diatribe on the delights of the hebridean strade bianche, otherwise known as surface dressing. in the days of restrictive roads budgets, many councils have had little choice but to attempt to stem encroaching road surface degradation by means of a thin film of liquid tar, dusted down with a coating of neutral grey granite chips. though i have no hard and fast statistics to back up my theory, it would appear that one of the most favoured paints for all manner of motor cars is metallic silver, a colour that is not one hundred pantone shades away from that of the surfaced dressed roads. probably riding on the same basis as many of the rest of the pelotonese, i have developed a natural tendency to read the road ahead, something that many motorists seem not to bother with. at least, not on the basis of the surprised looks on the faces of those i meet driving round the corners of many a single track road. but just to make the avoidance of a cyclist/motor car interface even harder to accomplish is the aforementioned metallic silver paint. only this past weekend, on two separate occasions, i came upon metallic silver cars that had remained hitherto unnoticed due to their blending in with surface dressed roads. neither encounter resulted in more than mild suprise on behalf of yours truly and arguably a smidgeon more from the folks behind the windscreen. thus, even in these lazy, hazy days of summer (who the heck am i kidding? have you seen the weather out there? ), there is an inherent need not only for vigilance, but perhaps for even more highlighting about one's person. that's a factor that was doubtless uppermost in the minds of the folks at portland's showers pass when fabricating their recently released torch socks. however, it would be fibbing to aver that they can be worn as a shining beacon in the midst of unruly traffic, less than fixated on a contraflow of darkened cyclists. 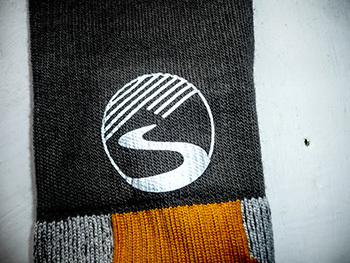 these orange topped, grey socks can be purchased in ankle or crew length and feature a scotchlite reflective showers pass logo on the rear. while this doesn't obviate any lack of visible recognition from oncoming vehicles, even in daytime, that logo might just catch the corner of someone's eye (not literally, you understand). 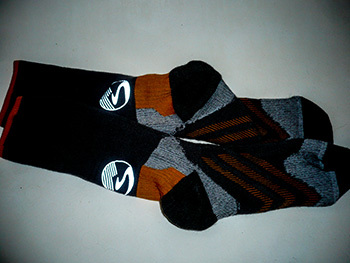 from a purely sock point of view, these promise to be quite hard wearing, though i am somewhat mystified by the presence of the orange chevrons and lighter grey panels, most of which will be concealed by one's footwear. however, a combination of merino wool, acrylic, lycra, nylon and spandex offers a remarkably good fit and a force-field of flexible strength will have them fresh looking in the sock drawer long after their compatriots are in landfill. the recent influx of showers pass products onto the shores of the uk has been most welcome, but like any new kid on the block, it takes time to have folks learn your name and reputation. despite the best and fervent efforts of sp's fraser ranson on this side of the pond, it has to be admitted that their products are not necessarily readily available in every british nook and cranny. however, with the ever-present assistance of the internet and its wonders to behold, you can now order items online in this country with prices shown in pounds sterling. 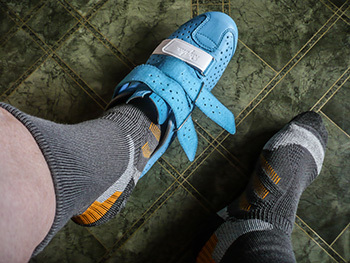 i figure you could start with the socks and then build towards a wardrobe of superior cyclist waterproofing. 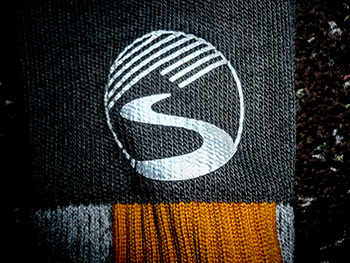 showers pass torch socks can be ordered in both ankle or crew length in medium/large or large/xtra-large in grey/orange, black, grey or white. crew length retail at £13.50 and ankle length at £12.95.